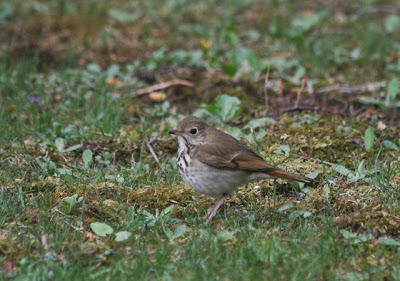 There is a beautiful hermit thrush hanging around the scrubby border of our yard, eating sumac fruits and occasionally coming out to toss leaves on the asparagus/rhubarb garden. Every day I hear its bell-like call through the double-pane glass, and I look for that thrushy outline as it hops springily on the ground. When it gets really nasty I'm going to scatter Zick dough on the ground where it forages. Everything gets fed eventually. Hermit thrush in the ruined asparagus. 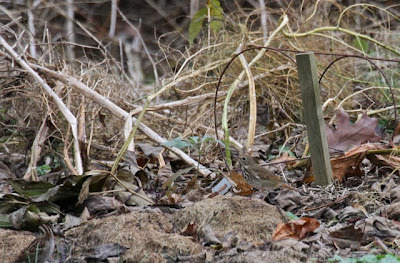 He's just left of the wooden stake. Hermits are a part of our wintering avifauna, though there are many winters when I see none. I'm grateful for this one. He makes my day. On December 2 I was deeply blessed with a small flock of robins that stayed in the yard most of the day. Every time I watched one it caught an earthworm in short order. There's plenty of sumac fruit to eat, too, but if you can get earthworms, stick with the protein. 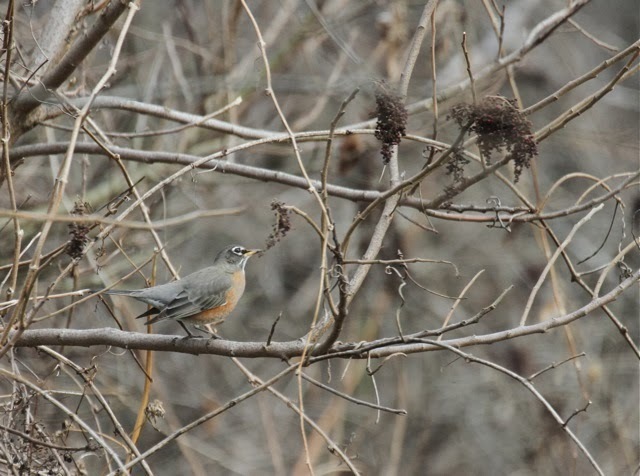 I may have sung the praises of robins in this blog before, but oh. This is one of my very favorite birds to paint. Look at the architecture of those wings, the clean geometric lines of this hearty chunky bird. They almost draw themselves. It's all so clear on robins. This time of year they have fresh feathers, each of which sports a frosty white edge. They're never more beautiful than in early December. The paler the better, as far as I'm concerned. Frost robins. I have recently become very concerned about our cardinal population. We've lived here for 21 years and I've never seen a winter when they were so scarce. We have two. 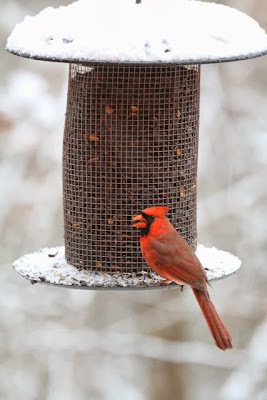 Our next-door neighbors report that they have none, Shila in Marietta has none, and an unofficial survey of other Ohioans around our state nets next to no cardinals. Athens, Little Hocking, Marietta, Whipple: practically none. Whatever could be going on? Do you have cardinals where you live? I'm trying to find out what's happening to them. This abundant bird simply can't be disappearing, can it? And if it is, why? Please leave a comment if you have any information or observations. Be sure to tell me where you live. 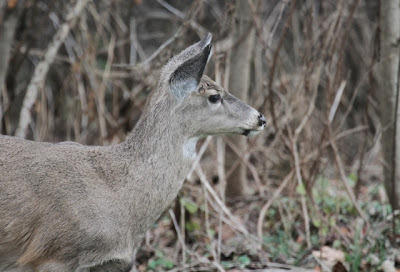 Button buck, have you seen any cardinals? I'll tell you where they are. Not here. Not in the woods, either, because I checked. I was so hoping one of these antlerless deer would be my fair Ellen, but I have yet to see her this year. Every year is different. She usually comes in December. I've got a little corn out, waiting. I'm waiting anyway. I moved to northeastern New York in June and have not seen or heard a Cardinal since I got here. At first I thought I was too far north, but a quick check of any range map shows them living here and up into Ontario. I too have wondered why there are no Cardinals. I live in Southeastern New Hampshire, and I continue to see Cardinals regularly, including our resident backyard pair. Haven't noticed a decline in this area. I live in Wilmington, Delaware. I have seen a few cardinals, but normally, after such a snow as we have just had, there would be a profusion of them. There were only a few at our feeders. But there were PLENTY of sparrows. Perhaps the cardinals are being crowded out by the smaller, more aggressive birds during the nesting season, and so there are fewer now? I'm concerned about the blue jays. We used to have so many of them, and I haven't seen ANY in such a long time. Maybe feral cats are to blame? We have lots of cardinals here in Quaker Gap, NC. I am in Northern NY near the Canadian border and in the town where I work, Malone, there are tons of Cardinals. You can hear them singing all the time. I had quite a day Saturday. Way up here where it has already been five below zero, we had two male Eastern bluebirds hanging around the yard for about half an hour, quite special. We also spotted as mink and had a coyote visit as well. 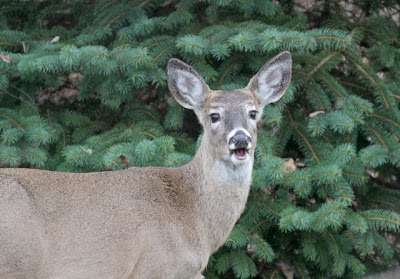 We are blessed with much wildlife up here. I did report my bird sighting to Cornell. I live in western part of Ohio in the Indian Lake region. I do have cardinals but not as many as I normally do. You're right, some years there are flocks of them outside my window at the feeder but not this year. Recently here at my feeders in northeastern PA I've seen 2 male Cardinals and 1 female. The males were having quite a time chasing each other around. Would they be defending their territory and/or fighting over the lone female this time of year? It seems to me our Cardinal population is down from our usual, too. I'm thankful we have some! We have lots of other birds at the feeders, Cardinals seem to be the ones we're lacking. I finally saw a female cardinal at the birdfeeders (up for about a month now) just this morning. No sign of the male. We have in the past had just one pair that visit the feeders during the winter. Even with birdbaths out all summer, we rarely see them then. I live in NW lower Michigan. Here in the western suburbs of Philadelphia I have 4 cardinals this year, down from 8 of the past few years. Many, many sparrows...this may be the year I try to learn the differences among these LBBs (little brown birds, as Birdchick says). Fewer bluejays, lots of various woodpeckers, many finches, mourning doves, a few wrens, lots of juncos although they came earlier this year than others. The robins have already descended upon the winterberries and the crabapple trees. Since the ground froze, they are not able to get the worms. I love the wintertime flocks. Oh, and NO monarchs at all this year. So sad. The cardinals are abundant as usual in North Georgia. I've also got a few hermit thrushes that visit my suet feeder in winter. Love them. I'm in central Indiana and don't get out much. I haven't seen any Cardinals around, but didn't think about it. I'll be on the lookout now. Wildlife Around Us has cardinals in Florida. Here in Toronto we know we have cardinals remaining in the neighborhood every winter but usually don't see them in our yard at this time of year. This year we are seeing a couple chez nous. A friend in Lexington, Kentucky, just posted a photo of five cardinals in her backyard feeder from this weekend. I love cardinals (and robins too!) so they CAN'T disappear! I know that sounds childish, but they can't be disappearing!! Maybe moving farther north with the weather warming up each year? Don't know. We don't get a lot of cardinals in our yard. We have two or three right now and that's all we will get until it snows. We have platform feeders and put seed on the ground. We also have a small opening in our tiny pond to provide water. Rondeau Provincial Park, southern Ontario. Here in Free Union VA we seem to have the usual number of male cardinals (in bad weather I have counted up to 10 around the feeders simultaneously) plus a bunch of females. Also a bazillion goldfinches, a goodly number of juncos, at least 4 blue jays, a handful of mourning doves, a few white-throated sparrows, some very busy and noisy carolina wrens, and a while back there was one hermit thrush - who may have moved on - and a pair of house finches. Plus a few nuthatches, and woodpeckers of several sorts... but nary a robin in sight! I would speak of bluebirds - but they (and there are a large number of them year round) stay up the road from us for the most part. Not sure why they don't seem to find our property suitable. Hmmmmm. That was a very long way to say we do have cardinals - and in the same numbers as every year. Blue jays and other corvids took a hit from West Nile Virus in many parts of the Northeast. Ocean County, NJ's population has bounced by nicely. I haven't seen any cardinals in my area, but really haven't been looking. My parents still have a nice resident flock in Lebanon, PA.
My mom used to get as many as 12 pairs at a time. She had a lot of springs and multi-flora rose bushes behind her house. My numbers have stayed about the same, usually 2 pairs. My daughter-in-law in Cincinnati reports that she's seen very few cardinals this year... nothing like the profusion she saw when they lived in Columbus 2 years ago. She, too, wonders what happened! I haven't seen many in the Reno (Ohio) area, I was just thinking the other day that the total number of birds at my feeders are down. I usually have a couple bluebirds that spend the winter with us but I believe the female, which had over a dozen broods in one of my boxes, has died because I haven't seen her since early summer. Haven't seen any robins either. I hope this isn't a trend we are seeing in the bird population. They are still plentiful here in East Central Florida. The pair that claims my backyard raised at least two broods this year. They come to my feeder often, but the wiley red shouldered hawk does take a toll on the young. Plenty of cardinals (male and female) coming to the deck in Midlothian, Virginia. 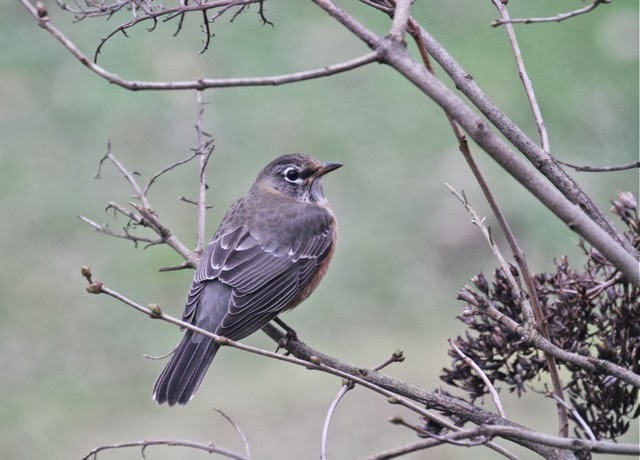 We had a flock of 10 robins land on the deck one day as well. 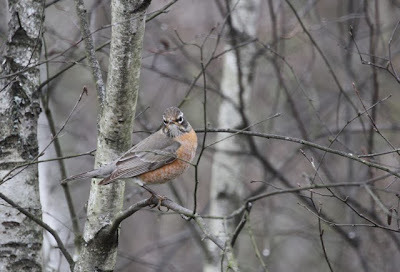 (Usually the robins are yard birds and I have never seen them land on my deck!) We also have quite a few bluejays, about 5 or 6 bluebirds and a metric ton of finches. I've seen both the pine and yellow rumped warblers. (So cute!) We have three kinds of nuthatches (white breast, red breast and brown headed) and many kinds of woodpeckers. Sad to say my pair of redheaded woodpeckers took their fledgling and left months ago. I miss them so much but hopefully they will return to make more babies. Feeding lots and lots of birds here! But have not noticed any decline in the cardinals. Funny, I was just thinking about cardinals. 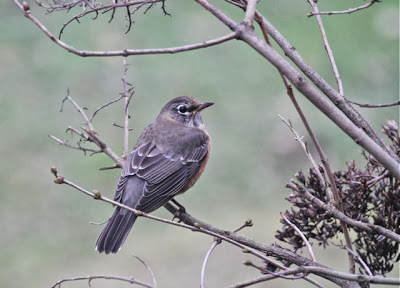 I am new to birding but they were one bird in previous years I would always notice in my backyard in So Eastern MN. I haven't seen any this year and was really hoping I would. I will be going on the Xmas bird count this Saturday and will ask my birding friends what they have observed. Gosh such an interesting and enthusiastic group of people, birders, and so willing to share their knowledge. 2-3 pairs at my house in the Blue Ridge and my parents have 2 pairs. Not a ton but some. I commented to one of my sons just Sunday that I haven't seen any cardinals for several weeks - since before I put the feeders out. Over the past few years, here in SE Portage County, OH, I've lots of them all year. And, as another commenter noted, lots of sparrow so far since the first snow. Look forward to your follow-up on this topic. I live in south central Wisconsin and I have the same pair of Cardinals this winter that have lived here for the last 3 years. The female regularly attacks any window so I'm pretty sure it's the same pair. Up until 2 weeks ago there were 2 juveniles that were with them. We are over run with American Goldfinches this year. Usually at this time there are 10-15. This morning I counted 10 on one feeder, another 7 in the bush next to it. My daughter counted another 12 at another feeder on the other side of the house. No Pine Siskins yet this year. We have about the same numbers for all the other feeder birds except Chickadees are up too. I've seen 7 at a time at one feeder. Any other time there's been just 2-3. I live in Rochester, New York. We had 2 pairs of cardinals during the spring but haven't seen any at our backyard feeders since then. 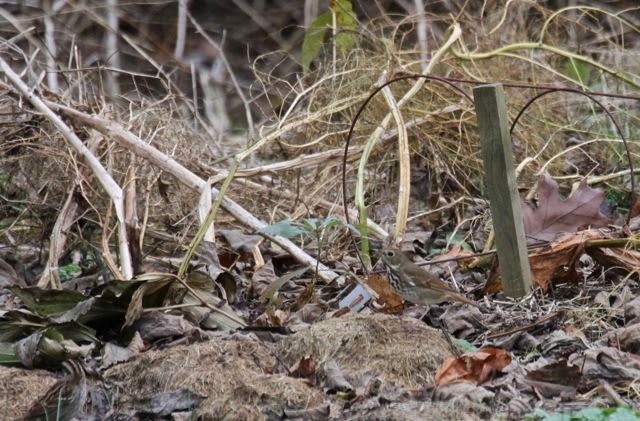 We thought we were the only ones who noticed they had seemingly disappeared. Haven't even seen any on our walks around the neighborhood or anywhere nearby, either. I live in central Iowa and we have an abundance of cardinals all year round. I love them too. I love their cheery song. I am just outside Detroit. Usually see lots of Cardinals, and have seen one all summer! Also on short supply, goldfinches and purple finches. The goldfinches usually number in the dozens and the purples in the hundreds. I have seen neither around here this year. I did see a couple winter-feather golds when we were up by Oscoda about a month ago. I'm in between Oxford & Hamilton. We're seeing few cardinals at the feeders this year. Actually, we've been noticing the lack of red and wondered about it, too. Hope someone comes up with answers. I do FeederWatch. Last year I averaged 3.4 cardinals, this year so far 5.2. The report on last year's data for our area (I am in Canton, Ohio--same region as you) is that cardinals were 5th most seen bird. The report says they are expanding their presence with a record %age of sites hosting them (and titmice). By the way, I love doing FeederWatch (Cornell Lab of Ornithology) and recommend it to your other readers. P.S. No monarchs for me either, and I raised lots from eggs I found on my milkweed the last two summers. I was REALLY bummed. Your post prompted me to look more carefully. I had posted this morning from SE MN saying I hadn't seen any cardinals yet. When I have had time today I have been looking out and about an hour ago just before dusk one appeared at my bird feeder! This morning snow was falling and the evergreen in front of the house was covered with Cardinals. Fifteen at last counting. My Christmas decorations can't compare with Mother Nature's. I am taking part in the FeederWatch project and these numbers are pretty consistent except that the Cardinals usually come in the evening. I live in north central West Virginia. I live in Schodack, N Y, a little south and east of Albany, and we have at least one pair of cardinals currently. I live just outside Little Rock, Arkansas, and we have cardinals here. I couldn't say for certain that it is the same number as in the past, but it seems like it. On the Carolinas border near Charlotte we seem to have as many cardinals as ever. New trends are: four bluejays who are making regular appearances -- never had many of them at all; hermit thrush; tons of snowbirds and mourning doves (not a new trend, really); no chipping sparrows like I usually have, but lots of another type I can't put my finger on (brown head stripes, but without any yellow). Only one fleeting monarch this year even though I have milkweed everywhere :(. Thanks so much for your blog, Julie! Here in central FL, I have also noticed a decline in cardinals from a surplus last spring. In my immediate urban/suburban neighborhood, last spring we had so many nesting pairs and offspring. However, I have seen only one or two in recent days. Mead Garden where I go to walk in "woods" and bird locally, last spring was teaming with cardinals, almost annoyingly so, but this fall only a few are left. I have noticed more raptors though. In my neighborhood three red-shouldered hawks fledged last summer and I still see at least two of these daily. In Mead, three Cooper hawks fledged last summer and I see at least two of those whenever I am there. I live in Oberlin and typically I'd have at 12 pairs in my backyard in the winter. This year I've had 2 pairs. The past 2 summers I've noticed cowbird babies in both the nests I've been able to somewhat monitor. Are the cardinals not able to raise enough young? My sister's yard in northeast Connecticut will have one or 2 pairs. I have not seen more Cardinals than these 2 pairs. We have the usual one pair at my feeder here in Toledo. Just saw one Monarch on my milkweed this year. I just counted 11 Cardinals at my feeder here in Adams County, Ohio. There are more in the garden where mammoth sunflower stalks hold up partially filled seed heads. I also see several when I take walks around the field edges. So far, Cardinal numbers are about average for this area. We live in a densely-packed part of Cambridge, MA, and am happy to say we have several cardinal families. Our (house)cats have learned their language: when an alarm call goes up, they go to the window to look for cats & I shoot outside to redirect. I hope what you are seeing is temporary. They are glorious. Hi Julie. I notice a decline in numbers of all species that usually visit our feeders and birding friends here say the same. Even the snow hasn't made much difference. I see a pair of Cardinals around, but usually have 10X that. Same for E. Bluebirds. Way too many House Sparrows...boo! Christmas Bird Count data will be interesting to see. Hope your Cardinals and Ellen show up soon! I've been too busy to do a count (finals week and all that), but we seem to have a cardinal or two whenever I look at the feeders, and on at least one occasion over the last few weeks, there were two pairs. We live on the north end of Parkersburg. Cardinals are the new kids on the block in Northern Vermont. The closer to Lake Champlain (and the more "temperate" zone 5 growing region that it is) the more cardinals I see. What I am wondering is: where are all of the grosbeaks! They were so many of them at the feeders of my youth in the mid 80's. Love your work, Julie, both art and writing.